Parameter Displayed : Voltage (Line to Line and Line to neutral), Current, Neutral current , Frequency , Power Factor(Pf), kW , kVA, kVAr, kWh, kVArh, KVAh, Demand, Import/Export Energy, RPM, Run hours, Load hours , THD Voltage & Current, Harmonies K Factor, Ampere HoursParameter Displayed: Voltage (Line to Line and Line to neutral), Current, Neutral current , Frequency , Power Factor(Pf), kW , kVA, kVAr, kWh, kVArh, KVAh, Demand, Import/Export Energy, RPM, Run hours, Load hours , THD Voltage & Current, Harmonies K Factor, Ampere Hours. 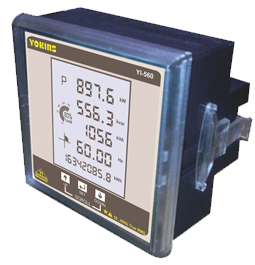 - Graphical LCD of high resolution with best combination of parameters displayed page wise. - Programmable sliding/fixed window, demand period, forecast/step demand control. Demand profile can be monitored with date and time. - Import/Export of energy is displayed in case of power generation (complete 4 quadrant energy measurement). - Two individually programmable relays 3A @240V AC. - kWh displayed in 10 digit format. - Run Hour displayed in 8 digit hour and minutes format. Auxiliary Supply: Universal Auxiliary(90-300V AC) Supply (Other supply voltages on demand). Accuracy : Class 1.0 and 0.5. RS-485 standard, communication capability using modbus RTU protocol.